Nvidia announced a new entry-level 16GB Shield TV bundle for $179 on Thursday, matching the price of the new Apple TV 4K launching tomorrow. The $179 Shield TV bundle comes with the console and Nvidia’s remote, but not the dedicated game controller included with the $200 16GB Shield TV. The omission lets Nvidia go toe-to-toe with Apple on pricing, but considering that the standalone Shield TV controller retails for $60, the $200 bundle is still the way to go if you plan to game on the Shield. It's a nice discount if you don't though. Nvidia also offers a Shield TV Pro with 500GB on onboard storage for $300 on Amazon, which can double as a Plex Media Server for local media geeks. All play 4K HDR video. And that really drives home the value proposition of the Shield TV. It’s easily the best media streamer for geeks, offering up the aforementioned Plex server capabilities, the Google Play Store, built-in Chromecast support, expandable storage via USB, over-the-air DVR options, a dedicated game store and the GeForce Now game-streaming service, the ability to play PC games from your GeForce graphics card-equipped computer, and in the future, it’ll even double as a SmartThings hub to control your smart home devices. The Nvidia Shield TV caters to the high-end, not the lowest common denominator, and easily justifies its price. Apple’s new $179 box is also vastly more expensive than the Roku Ultra or Chromecast Ultra, both of which offer 4K HDR support. Apple’s pricing seems significantly out of whack against the competition. 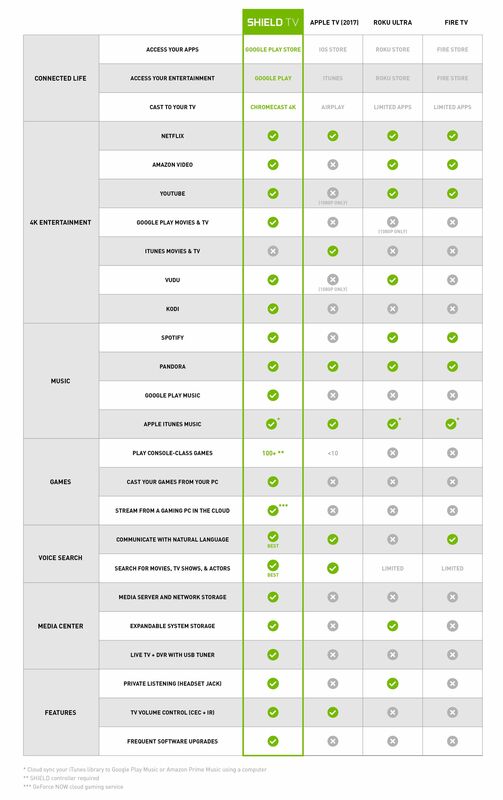 This Nvidia-supplied graphic compares the Shield TV against the 4K Apple TV, the Roku Ultra, and Amazon's Fire TV. Take any material from a company with skin in the game with a big pinch of salt—and note the lack of a Chromecast Ultra comparison—but it all seems legit. Preorders for the $179 Shield TV bundle open today on Nvidia’s Shield TV website, and the hardware will ship on October 18. 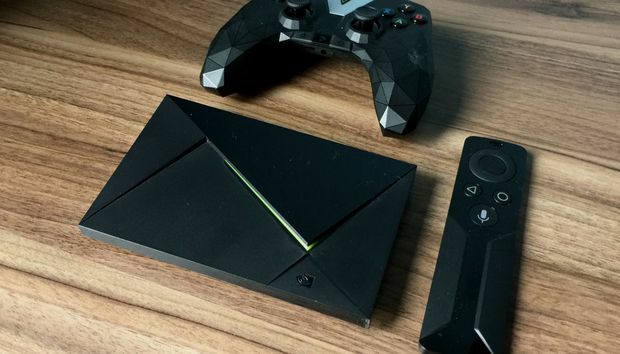 Be sure to read TechHive’s Shield TV 2017 review before you buy, and again, the $200 bundle (which is already available) looks like the better option if you’re a gamer.